NEW WINGS – In this photo from last April, Anwyn Tillet competes in a freestyle skiing competition at Mount Sima. She won two gold medals in Whistler last weekend (inset). On the day her Grade 4 class was going skiing at Mount Sima in March 2016, Anwyn Tillet didn’t want to go to school. She asked if she could stay home. She didn’t want anything to do with downhill skiing. Anwyn was hooked on the slopes. She went skiing three or four more times with friends at the tail end of that season. She loved the spinning, and taking the calculated risks. After five years in the Whitehorse Minor Hockey League, Anwyn asked to join freestyle skiing. And in September 2016, she began trampoline training with Freestyle Yukon headcoach Graham Pollock. Last weekend, as the only female member of Freestyle Yukon’s competitive team, Anwyn won two gold medals at the Super Youth competition in Whistler, B.C. She placed first in her under-12 age group in the slope style event when she posted a score of 44.25. Not only was her score 16 points higher that second place, it was the highest among the U-10 and the U-14 age groups as well. Most of Anwyn’s competition was from the larger and well established teams like the Vancouver Freestyle and Whistler-Blackcomb clubs. 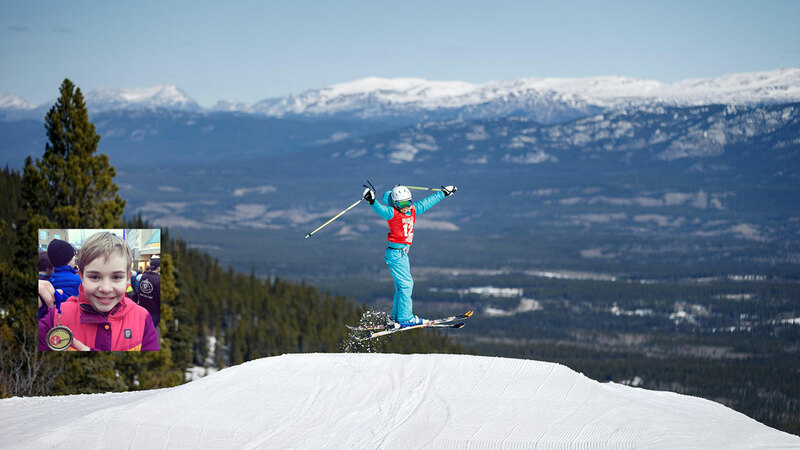 In Sunday’s big air event, the 11-year-old finished first in the U-12 class and her score of 63.67 was second among the three age groups, and just four points behind the highest score posted by a U-10 freestyler from Whistler-Blackcomb. She doesn’t know where her path into the freestyle world will lead her. For now, she’s just doing it and having a blast. The headcoach sees a young athlete with an abundance of promise. If Anwyn stays with the sport, she has a bright future in it, said Pollock. He’s been involved with freestyle as a skier and coach for 17 years, since he was a kid growing up in Ontario. Two of the last seven years as a coach have been with Freestyle Yukon. He said from the first day he saw Anwyn on the trampoline, he recognized the potential. She has what it takes to keep advancing, perhaps all the way to the top, Pollock believes. He pointed out the competition down in Whistler was for skiers who’ve mostly grown up on ski hills. “She is extremely athletic, and she is motivated, which is very good,” said the headcoach. “But she is very, very athletic for someone her age, boys or girls. Anwyn now trains five days a week: two days on the trampoline, one day of dryland and two days on the slopes. Pollock said he and coach Milan Lapres would never ask their skiers to do anything they were not capable of doing, or something that was unsafe. Pollock said Anwyn has the three essential characteristics to become elite in sport if she chooses. She has the natural talent, the determination and the courage, he said.